This professional surveillance camera is for use indoors or outdoors. Built-in IR illumination for up to 98ft. Eclipse remote video technology allows users simple access to live or recorded video from anywhere directly on a mobile device, tablet, Mac or PC with no need for technical network or router configuration. Eclipse ES-Station offers a future-proof solution that grows with your needs. Our software seamlessly allows remote connections to 1024 channels. You can remotely monitor and control all your locations from one software. It also offers tight integration with all our Signature products. Note: ES Software only supports 64-bit system compatible with 32-bit. 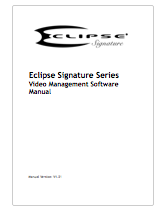 Eclipse Signature cameras automatically can detect when a camera goes out of focus and immediately alert your staff or managers so they may quickly act. Defocus is an important feature that ensures your cameras are running and functioning properly.